I’ve recently realized that I should rethink and rebuild my deferred renderer’s pipeline a bit, since sometimes small artifacts cropped up when render elements didn’t adhere to the same rules. Therefore, I’ve created a graph to get a high-level overview and orientation. Luckily I’ve gotten some help on twitter – especially from Mikkel Gjoel and Nathan Reed. I am pretty happy with the results right now, and it might be useful to other guys starting out, so I thought I’d share. Note: I’ve duplicated the yellowish light in the middle. You can see how color and intensity values are different for linear/nonlinear rendering. The color on the left is actually the color of the light, it clearly gets lost in gamma space rendering. IMPORTANT: This applies only to non-linear textures. If your input is already linear (texture format = SRGB) you don’t have to do this. Likewise if your output renderformat is SRGB you don’t have to convert back. I’ll refer to the wikipedia page for high dynamic range rendering, it gives a good overview and has lots of relevant sources provided at the bottom. In the case of my engine it means that my lighting is effectively not limited by the 0…1 range. Usually if you have a light that renders a pixel completely white (rgb = 1,1,1) and you add another light on top it will not make a difference, the pixel stays white. This makes dealing with lots of lights of different intensity values rather bothersome. If we use a high-precision rendertarget format like fp16 (16bit float per color channel), we are not limited by these boundaries any more and can accumulate much more color before we hit technical boundaries. This also means that our color range is potentially greater than what our monitors can display, so we have to bring it down again with tonemapping later on. This is pretty much a stock deferred renderer. If we didn’t use HDR we might as well have a finished image after the compose step. A g-buffer is created that stores all relevant information per pixel, in my case: albedo, normals, depth, roughness, metalness and materialtype in 3 rendertargets. Color and lighting get combined in the Compose pass. Note: SSAO is also added here. 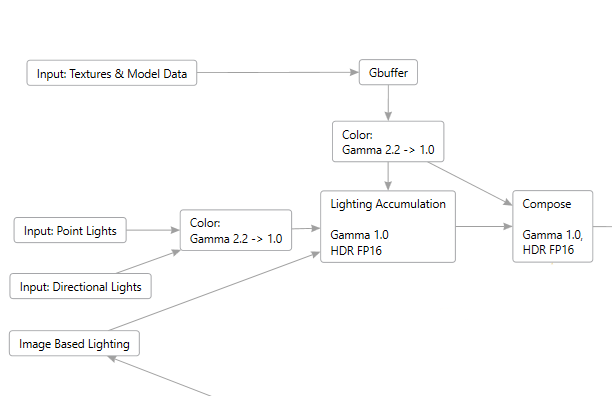 For the linear pipeline we need to convert gamma for all color elements first though. We save the mesh textures “as is” in the Gbuffer, because our albedo is stored only in 32bit color (R8G8B8A8) so converting gamma beforehand will yield in information loss. To give our rendering a more coherent look, especially in areas that are not directly lit, we can define one or more sample points that capture the lit scene from all directions and store this capture in a cubemap. We can then use this to add light contribution for all our meshes, which emulates the way that light bounces off of objects to lighten the scene. 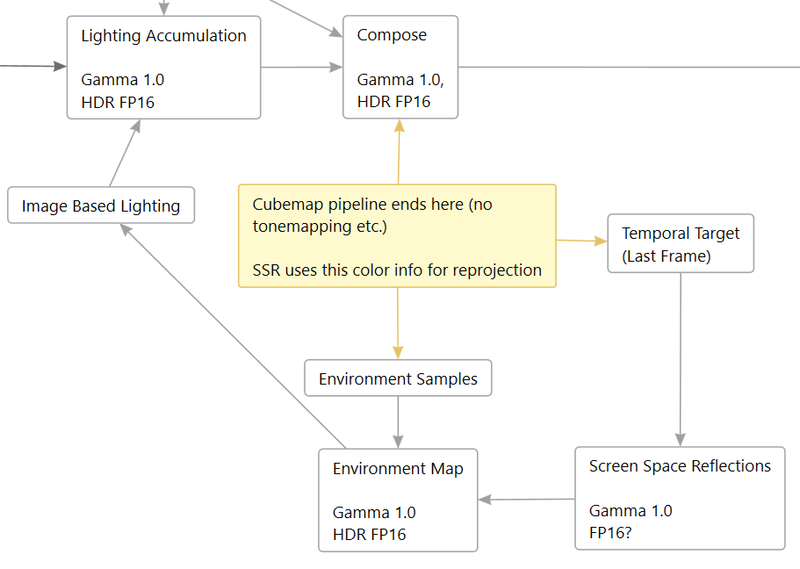 This environment sample must be captured in linear HDR space, so we can use it without modifications when we use it to light the scene and it will be consistent with the pipeline. We could also plug in HDR captures from real images instead of making our own. On top of that we can use “Screen Space Reflections”, which further add to the scene looking coherent. Again we want to sample the HDR image to be consistent. We combine both for our final image – we fill in the gaps where SSR fails with our environment sample. Knowing when to use TAA is not trivial. On the one hand you want to apply it before your HDR post processing like bloom, for example, because it can vastly reduce flickering and strobing artifacts. On the other hand, as seen in the second paper, TAA should be done after tonemapping, so that pixel brightness is weighted a lot less. For the final steps I do HDR post-processing, then tonemap down to LDR, convert back to gamma space, convert to a 32bit rendertarget and finally slap some low-quality post processing on top. You can see in the image to the right how the detail in the bright spots is totally crushed when not applying tonemapping. I chose Jim Hejl’s filmic tonemapping for my implementation. It is worth noting that I did not include some other steps in-between. For example forward rendering for transparent objects and Screen Space Ambient Occlusion are absent. Forward Rendering passes would be done after composing the deferred image. Particles, for example, are a notable case where they could be inserted after Temporal Antialiasing even (right before HDR Bloom), since they do not usually contribute to aliasing much and are hard to tackle for TAA algorithms. Even though this overview is specifically written for a deferred engine, most of the stuff applies to basic forward renderers, too. Thanks for sharing the best posts they very nice and very useful to us. I am very satisfied with your site and your posts they amazing. I got such a good information on this topic.